Dhaka. 10 April, 2019. 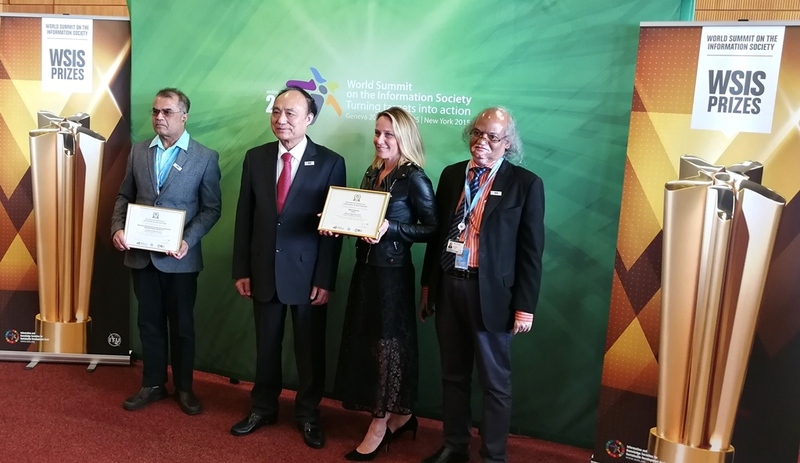 Community Radio related two Initiatives of Bangladesh NGOs Network for Radio and Communication (BNNRC) have been recognized as Champions in UN World Summit on the Information Society (UN WSIS) Prizes 2019. Mr. Rezaul Karim Chowdhury, Chairperson of Board of Trustees of BNNRC and Executive Director of COAST Trust has received the UN WSIS champion certificate from Mr. Houlin Zhao, Secretary-General of UN International Telecommunication Union (ITU) on Tuesday 9 April 2019 at a ceremony at Geneva International Conference Centre, Switzerland as part of the annual UN WSIS Forum 2019. International Telecommunication Union (ITU) announced 90 Champions of the prestigious World Summit on the Information Society (WSIS) Prizes contest while the 18 Winners, out of these 90 Champions. WSIS Prizes is a unique international contest developed in response to requests from the WSIS stakeholders to create an effective mechanism to evaluate and recognize individuals, governments, civil society, local, regional and international agencies, research institutions and private-sector companies for outstanding success in implementing development oriented strategies that leverage the power of ICTs as an enabler of the development. WSIS Prizes has been recognizing remarkable efforts made by entities and organizations from around the globe that focus on accelerating the socio-economic progress of the whole world as a community. The contest was held for the first time in 2012, and rapidly gained attention and popularity within the ICT for Development (ICT4D) community. BNNRC is in Special Consultative Status with the Economic and Social Council (ECOSOC) accredited with World Summit on the Information Society (WSIS) of the United Nations. BNNRC’s approach to media development is both knowledge-driven and context-sensitive, and it takes into account the challenges and opportunities created by the rapidly changing media environment in Bangladesh including community radio development giving voices for the voiceless. It would be mentioned that BNNRC won the WSIS Award in 2016 as the winner and champion of 2017. BNNRC has been chosen for this award on account of its creative thinking, critical analysis, strong leadership and exceptional innovation of community media sector contributing towards voices of the voiceless people in rural Bangladesh.